Taste tested and triumphant recipes that will inspire you to eat Vegies for Breakfast. Mushrooms are simple to cook, requiring the absolute minimum of preparation and attention to become your best meal ever. Their unique meaty texture and pungent, earthy flavour is such a delight on a cold morning, offering sustenance for whatever the day might bring. Mushrooms, once, had a season. The mellow mists and fruitfulness of autumn, when the warmer days get shorter, the chill at dusk melts into brisk evenings and cold, still nights. This is the weather of the mushroom. Autumn is the season of the mushroom. However, modern production methods mean mushrooms are available all year round. Clever, clever people have refashioned disused train tunnels and damp stone buildings to grow very special mushrooms. We are lucky, us mushroom eaters, spoiled for choice, all year round. In spite of this I keep to a mushroom season. I look out for special mushrooms when I notice the weather might have conspired to produce them. If I am lucky, taking a walk down under the pine trees may yield beautiful orange gold pine mushrooms and heavy, spongy slippery jacks, along with a few regular brown mushrooms. Sometimes other foragers have beaten me to it, and the mushrooms are in baskets at the farmers market or the local farm gate. Foraging is not possible for everyone anyway, so the stroll you take might be around the market, green grocers or supermarket. There you can find buttons, swiss browns, Portobello or large cups, as well as oyster, enoki, king browns, shitake. Maybe even a small pack of exotics like woodear and shimeiji. Wherever you source your mushies, chooses a few different types. Each variety of mushrooms is boldly, distinctly different and it’s worth exploring and deepening your appreciation. I’m going to make a suggestion in this post that makes me cringe a little. I’m going to suggest you use your sandwich press or flat grill to cook the mushrooms. I have been tracking a trend in the food media- the refashioning of the bring-your-own-lunch. Through this I have seen suggestion of using the barest of lunch room facilities to prepare some outstanding and innovative office lunches. Imagine using the sandwich press to cook slices of chicken, sweet potato, wilting spinach, frying eggs and bacon, for melting haloumi and grilling apples, and all done on demand in a short lunch break. Fresh, cheap and tasty. This is what Vegies for Breakfast is all about. I’m climbing on board. Grilled mushrooms with pistachio gremolata for one. This mushroom recipe can be done a-la-traditional in a searing hot frypan, or on the sandwich press. You will need a chopping board and a cook’s knife. 2 king oyster mushrooms, 4 regular oyster mushrooms, one large Portobello, a ‘bunch’ of enoki. Gather your mushrooms, trim the ends and if very dirty, wash them. It is a myth that you shouldn’t wash mushrooms, just use them immediately after washing. Ease the stem out of the large mushroom and if the skin is tough, peel it away. This is good compost. Slice lengthways, just less than a cm (the thickness of a slice of bread, actually) and put into a bowl so that they may be seasoned and oiled. Toss the mushrooms with olive oil, salt, pepper, a couple pinches of smoky paprika, lay on to the hot grill plate and close the lid. The grill will do it’s work, but if the mushrooms are failing to sizzle, oil or spray them and the grill just a little, to get them going. While they are cooking take a tablespoon of pistachios, a handful of washed parsley and chop to fine. Use a very sharp knife for this so you don’t get a minced green mush of parsley. Place this in a bowl and zest in ½ a lemon. Mix with a fork to combine. At this point, if you love heat, you can add some finely chopped fresh red or green chilli, or a pinch of chilli flakes, and stir this through. 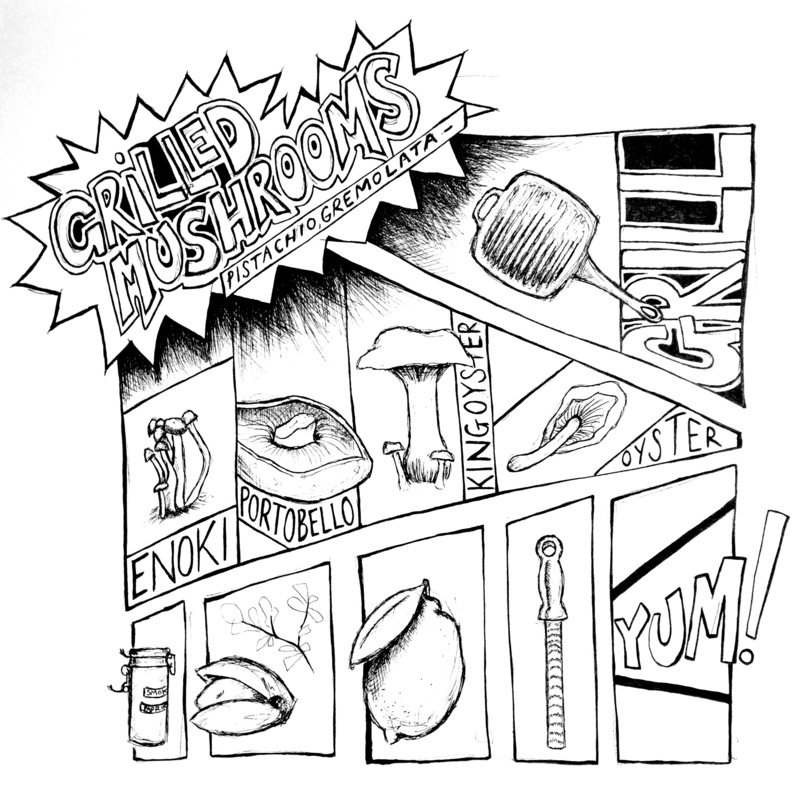 Check your mushrooms as you go, the thinner stemmed enokis will be ready before the other thicker sliced mushrooms. Once the mushrooms have softened and cooked through, gained a bit of crusty colour from the press, lay them on a plate and sprinkle with the gremolata and if needed, season with salt, pepper and a spritz of sherry vinegar. My final word of advice- when foraging for mushrooms, you MUST know what you are looking for, or take someone who does. Those stories are not urban legend, many mushroom varieties are poisonous, and you can die from eating the wrong mushrooms.